Harold has dark brown receding hair, bushy eyebrows, a bushy mustache, and a has stubbles down to his chin. 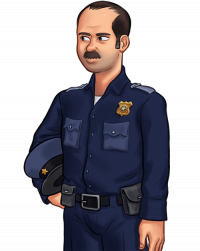 He is always seen in his blue police uniform. Despite being the law, or the authoritarian figure in the house, Harold is submissive of his wife Helen as he complies to everything what she says. This can be due since he's scared of being berated by his own wife being a strict, christian mother she is. Harold is the husband of Helen and the father of Mia. He's the local police officer. Between work and coming home to a strict christian wife, his life is miserable. He lets Helen do as she must, and as such doesn't control or question of how much of what happens in the house including how Mia is raised.